Shopping malls are a great place to go if you want to feel very depressed. Made obsolete by online giants like Amazon, most malls are dying, if not already dead. Wandering around a mostly empty mall can feel like walking through a ghost town. If you listen close you can hear the wailing specters of Brookstone massage chairs and Sbarros past. Until today, however, you physically had to go to the mall if you wanted to grab a piece of that depression for yourself, which can prove tricky if you’re already very depressed. 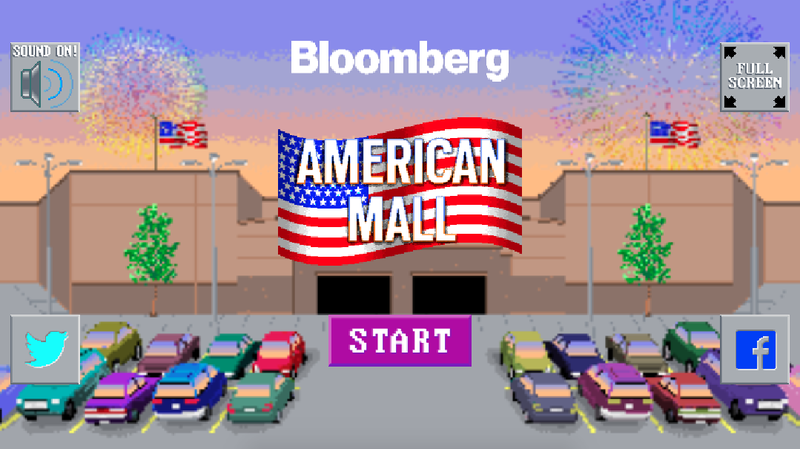 Enter American Mall, the new video game from, uh, Bloomberg that lets you experience the thrill of running a failing shopping mall right in your browser. The game puts you in control of one of four characters who, in some strange fit of insanity, has decided to buy a struggling mall. The goal of the game is to keep your mall afloat as long as possible, although eventual failure is mostly inevitable. You spend most of your time negotiating with tenants, choosing between allowing them untenable breaks on their rent, or forcing them to close in the hopes that a more profitable business will take their place. (Hint: It won’t.) You must also decide between agreeing to humiliating promotions and events, or keeping in place the sanctity of the mall. (Hint: Go with the humiliation.) It’s kind of like SimCity, except everyone hates you and one day you’re going to die. Every moment you spend in this cursed mall another tiny piece of yourself is lost forever. The mall is a prison with no bars. You are also for some reason personally charged with keeping the place free of rats and picking up trash left on the ground by your horrid customers. It’s a nice change of pace from talking to your miserable tenants. Failure seems unavoidable (for what it’s worth, Bloomberg editor Thomas Houston does say winning is possible), as you seemingly always end up running out of money or happiness. It’s a depressing look into the decline of the American shopping mall, as well as probably America in general. Things are bad and they’re only getting worse and there’s absolutely nothing you or anyone else can do about it. Be sure to hit up the Cinnabon on your way out.